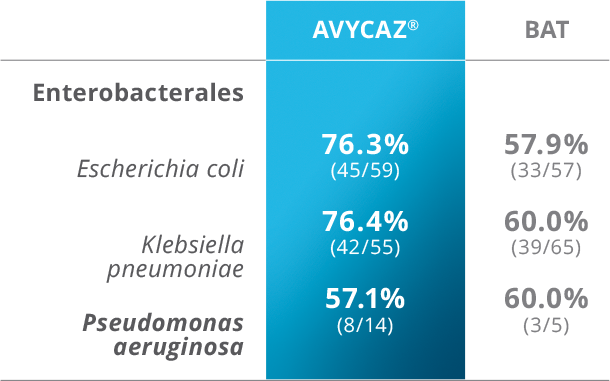 305 adults hospitalized with cUTI, including acute pyelonephritis and complicated lower urinary tract infections, due to ceftazidime-nonsusceptible Gram-negative pathogens. The mMITT population consisted of 281 cUTI patients with at least one baseline ceftazidime-NS uropathogen (defined as MIC greater or equal to 8 mg/L for Enterobacteriaceae and greater or equal to 16 mg/L for P. aeruginosa). The median age was 65 years and 54.8% were male. Best available IV therapy (BAT)—meropenem, imipenem, doripenem, and colistin—for 5 to 21 days of total therapy. 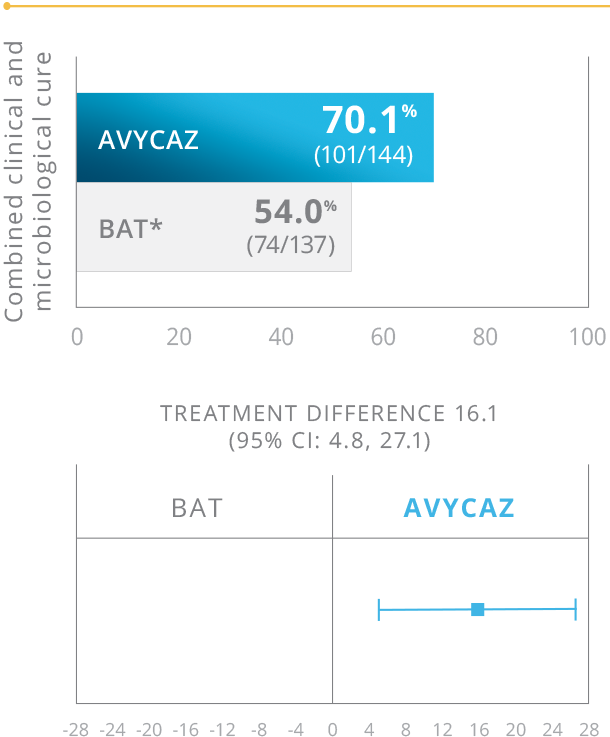 The majority (96.1%) of patients in the BAT arm received monotherapy with a carbapenem antibiotic. There was no optional switch to oral therapy. Evaluation of both the clinical cure (defined as resolution or significant improvement of baseline cUTI signs and symptoms) and microbiological cure (all baseline uropathogens were reduced to less than 104 CFU/mL) rates at the follow-up visit (21 to 25 calendar days from randomization) in the mMITT population.